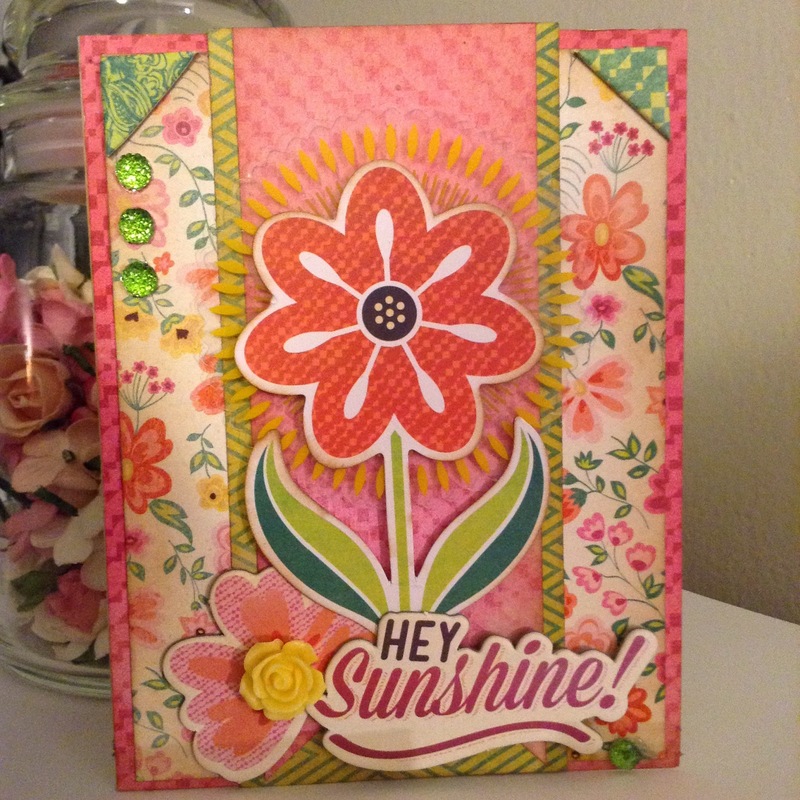 With so many beautiful papers and embellishments in the Vivienne, by Basic Grey "I want it all" Bundle, by FotoBella, it was easy for me to get creative making cards. This little charmer was made in only about 10 minutes, and everything I used was in the Vivienne Bundle! 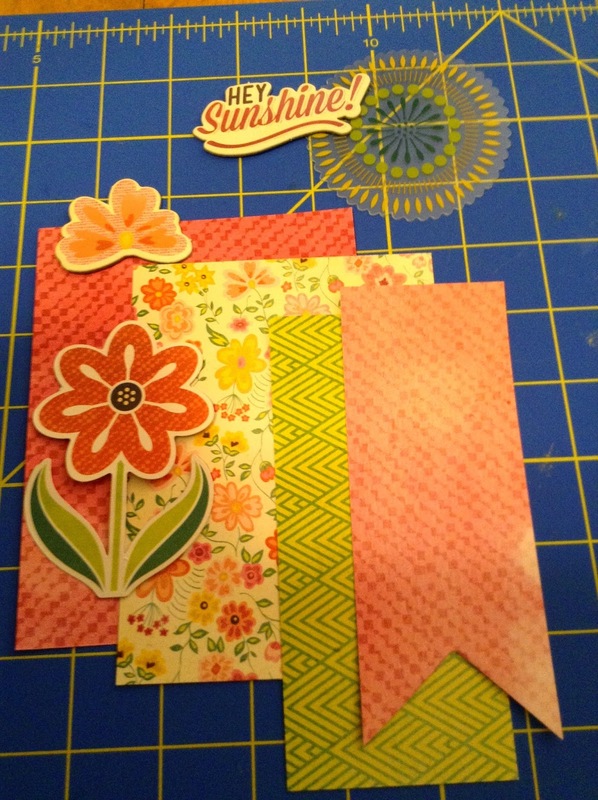 To make this card, you will need 4 different pattern papers from the Vivienne, I want it All! Bundle. From the bundle, select the small flower, larger flower, Hey Sunshine! sentiment, and corners from the Basic Grey Vivienne Chipboard Shapes, the acetate sunray from Basic Grey Vivienne Frames with Acetate Overlays, and a resin flower from Basic Grey Vivienne Resin Flower Stickers. Cut a background out of the dark pink paper at 4 1/4" x 5 1/2". It will cover the entire A2 size card. Cut the floral paper at 4 x 5 1/4" and the green diamond patterned paper at 2 1/2" x 5 1/2". Lastly, cut the banner out of light pink paper at 2 1/8" x 5 1/2". (Cut a v-shape out of the bottom to make the banner.) Distress all edges if desired. Adhere all the papers to an A2 size card as follows: (Large pink paper covers entire card. Adhere the remaining papers to the card, centering them. The floral pattern, green diamond pattern and dark pink banner all get adhered to the pink base. Glue the acetate sun to the back of the large chipboard flower, facing up. Let dry. 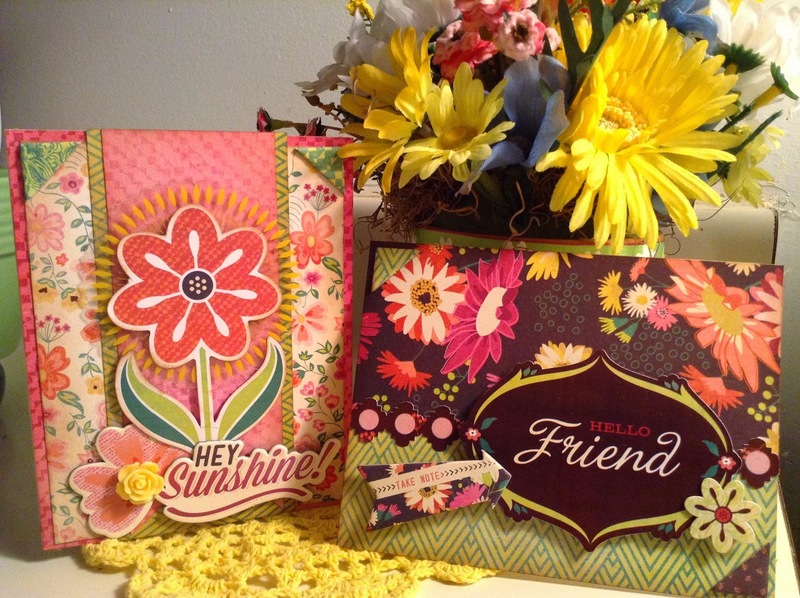 Place large chipboard flower in the center of the card, and using pop dots, adhere to card. 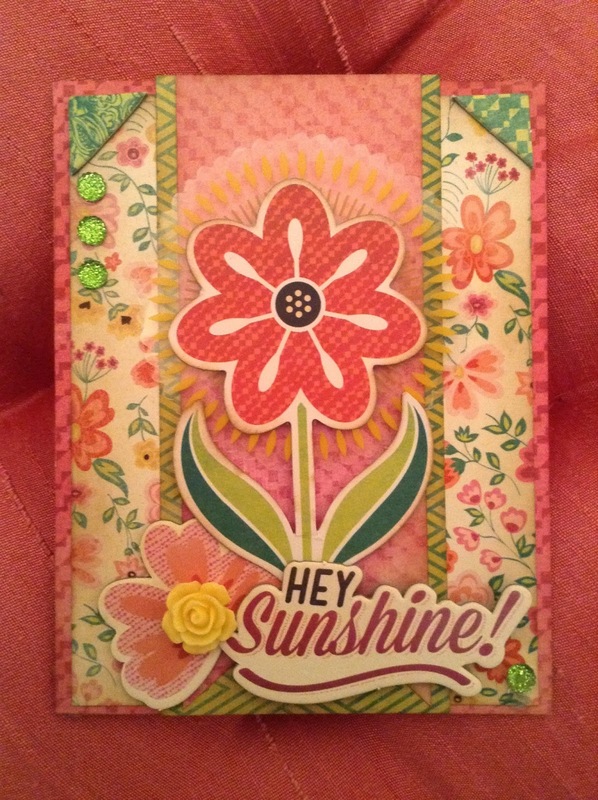 Adhere the Hey Sunshine chipboard sentiment to the base of the flower, using pop dots. Tuck the small pink flower under the bottom of the large flower, and adhere to the card with tape runner. Place a resin flower on top of the pink flower in front of the sentiment. remove the backing and press down. If you're like me, you want a paper collection that is versatile and can be used to make several kinds of projects. Vivienne is just that collection! I hope you try it out and see what I mean!